Wondering where to get those pairs of long feather earrings? Or the silver balis that will enhance your Indo-western look? 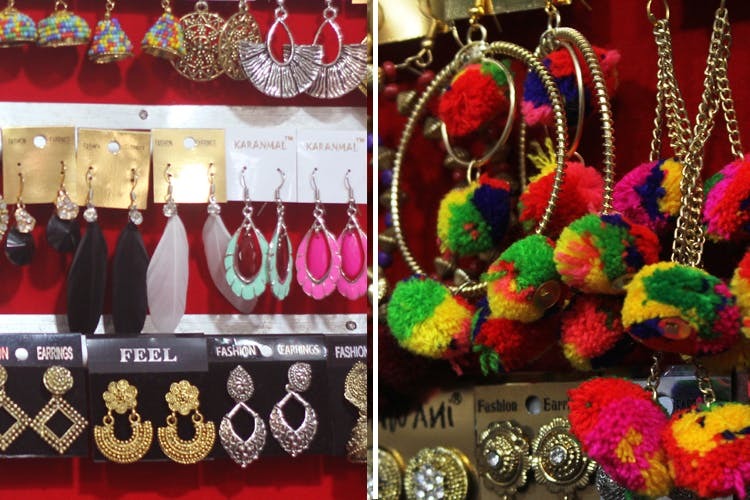 Pick up your wallet and head to these five places to get the best earring collection, just for INR 100 or below! Head to Fashion Street with your girl gang and get those pretty little dreamcatcher earrings you’ve been hunting for. What else? Season’s favourite: The multi-coloured feather earrings! INR 50 is what you have to shed. As long as you’re there, do check out the the classy gold-plated ear cuffs and the silver chandelier earrings. Looking for oxidised jhumkas to go with your chikan kurta? Hong Kong Lane at FC Road is your one-stop earring destination! From stunning drops to silver balis studded with colorful stones, the assortment is large and cheap. If gold is what you love, Laxmi Road is your answer! The gold-plated floral studs under INR 100 are big hits at this old Puneri bazaar. Don’t forget to check out the neck-long danglers that’ll perfectly blend in with your mum’s Benarasi saree. Hoop earrings with pearl and emerald drops are highly recommended! Head to Tulsi Baug and get your bling game right on track! The place is a treasure trove of everything gold and silver that is not so hard on your pocket. We loved the tiny quirky studs ranging between INR 40 and INR 100. For those who don’t have piercings, go for the clip-ons or the magnetic ones. They are cute and very easy to wear! Girls, FC Road is your ultimate earring destination if you’re looking for authentic chandbalis and jhumkas, danglers, hoops and clip-ons. Whether its a date night or a goth club get together, FC Road has earrings for all your looks and mood. Don’t worry about the price range, just keep your wish list ready! When it’s about street shopping, we advice you to bring out your A-class bargaining game. Trust us, it’s an unparalleled satisfaction when those prices get halved!